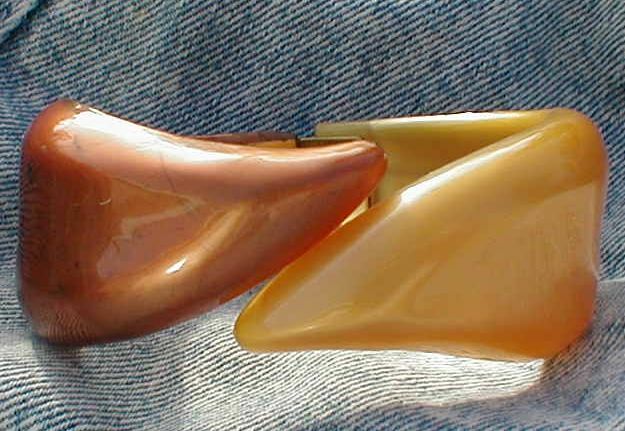 Vintage thick solid plastic in marbleized deep copper tan color paired with warm pearlized gold, this molded flared end clamper cuff is a true classic. 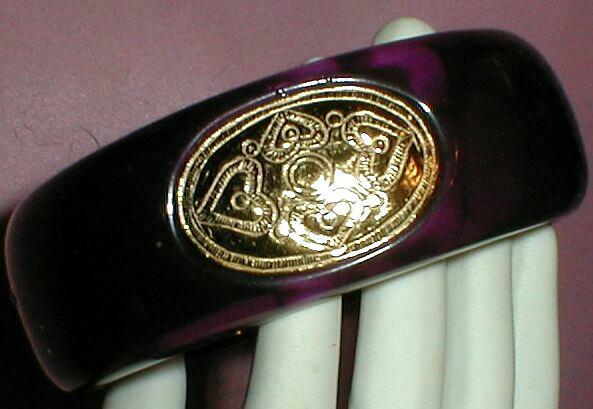 Opens on a hinge, fits comfortably on a medium wrist. Domed shape, with three golden oval medallion inserts with incised scrolled hearts pattern. 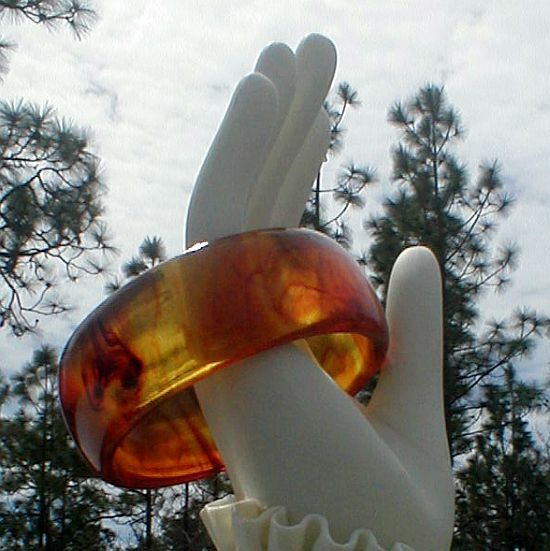 Fairly weighty thermoset plastic with the look of bakelite, by Liz Claiborne. 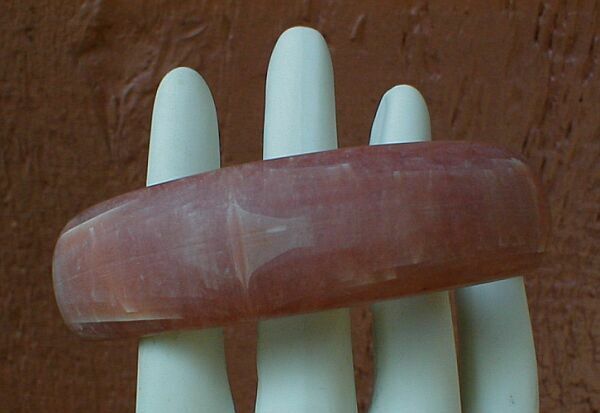 Size: 1 1/8" W, Large fit, 2 7/8" dia. Matte finish with lighter variations in laminate, Italian plastic. 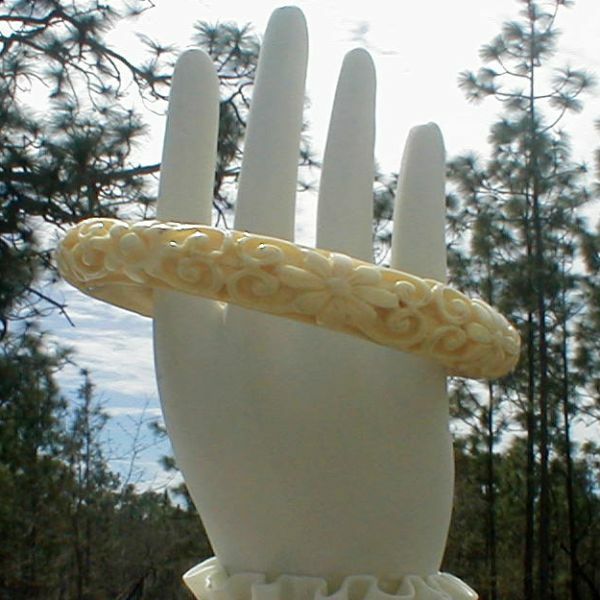 Deeply molded roses in imitation ivory with alternating inserts of amber-like plastic. New but vintage uncirculated stock, age unknown. 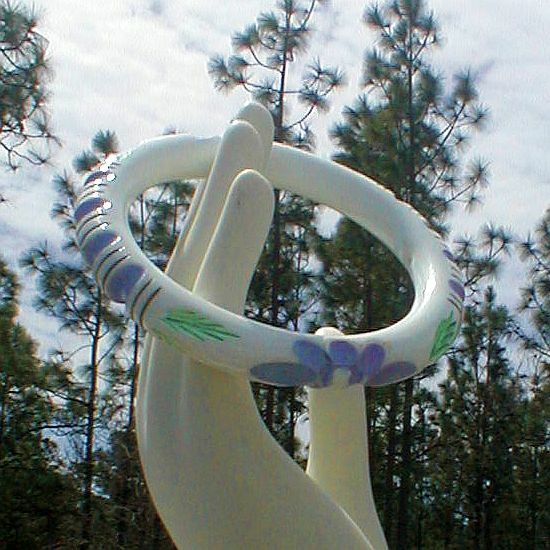 Marked Sarah with copyright mark, one of the many Sarah Coventry marks. Size: 1 1/8" W. 2 5/8" dia. for Medium fit. Plastic in ivory color with carved Oriental style florals. Plastic with carved Oriental style florals in blue with green leaves. 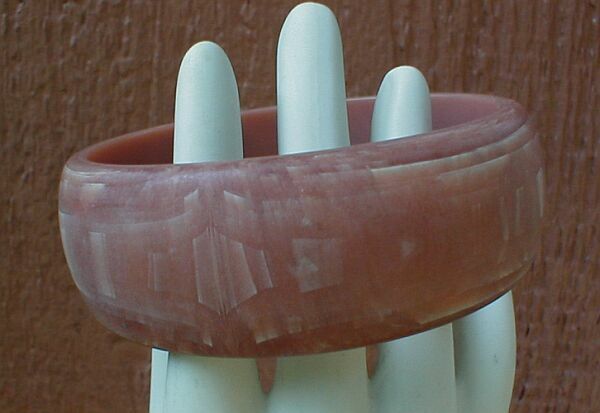 Bakelite bangle in root beer colors. 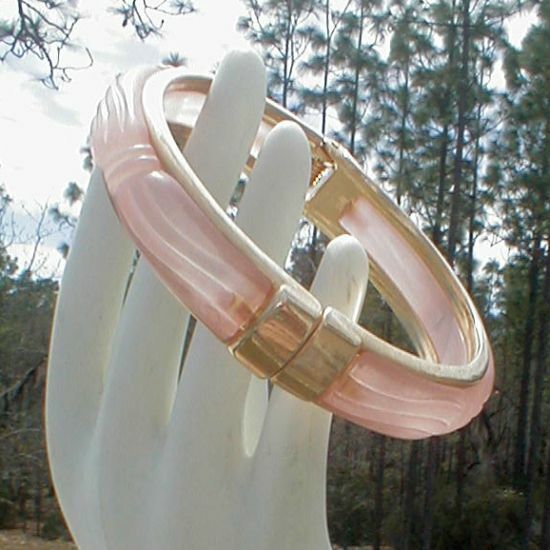 Carved in delicate swirls of semi-opaque pink Lucite in two sections on goldplated edge frame, opens on spring. 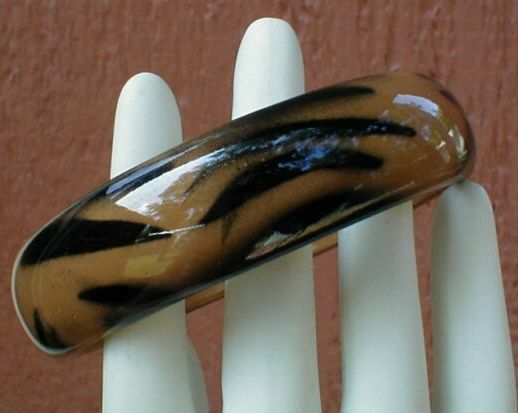 Black free-form stripes in tiger-like pattern makes this bangle fun to wear. Quality solid thermoset plastic made in Italy. 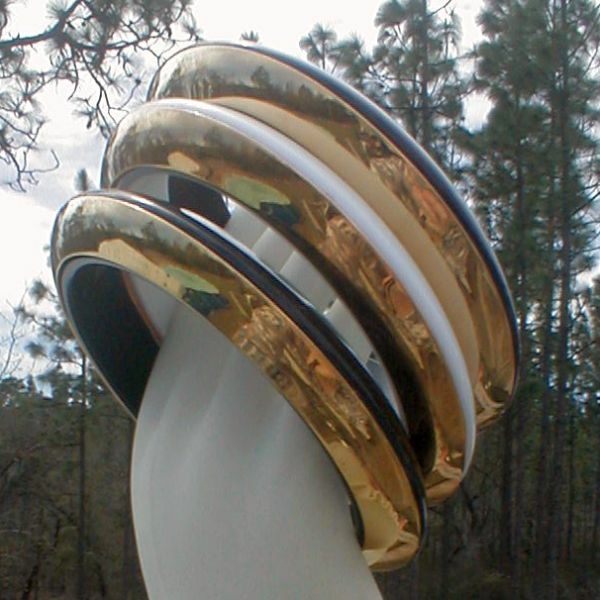 Three bangles, two in black and one in white and half goldplated, make it fun to wear in OREO cookie style. Quality solid thermoset plastic in comfortable weight, marked MONET inside.